Later this month, Redhook Brewlab in Seattle hosts IPA Daze, a two-day event featuring beers from 18 Washington breweries. As the name suggests, IPA Daze is all about IPA. In all, expect 32 IPAs on tap, 15 of which head brewer Nick Crandall and his team at Brewlab created themselves. The list of other participating breweries is included in the info below. IPA Daze takes place at Redhook Brewlab on Saturday, April 20 and Sunday, April 21. SEATTLE – April 2, 2019 – Redhook Brewlab is bringing back IPA Daze, its India Pale Ale party, for a two-day extravaganza to celebrate craft beer’s number one style. The two-day event will feature more breweries than 2018’s event. This year, the event will boast 32 IPAs from 18 of Washington state’s top breweries, including host Redhook. As with 2018’s inaugural event, hopheads can expect a variety of takes on the IPA, from traditional and imperial IPAs to fruit IPAs and hazies. A portion of the proceeds will once again benefit the Surfrider Foundation. “We had so much fun doing this event last year, celebrating creativity among the Washington brewing community and raising money for charity, we thought ‘why not do it again but bigger?’” said Redhook Brewlab Brewmaster Nick Crandall. “Last year was one of the biggest weekends of the year for us,” he added. IPA Daze will run Saturday and Sunday, April 20 – 21, from noon to midnight on Saturday and noon to 10:00 p.m. on Sunday. 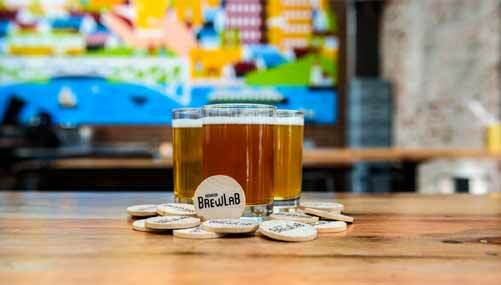 Guests will find 15 different takes on the style from Crandall and his team at Brewlab. Among the IPAs Crandall will brew for the event: Force Output, a triple IPA, Mana Vault, a hazy IPA, When Life Gives You Limes #2, a lime IPA, Hempocrat, a hemp seed IPA, and a can’t-miss milkshake IPA – Shake that Tangerine – on nitro. Of course, Redhook favorites Peaches for Me IPA and Atomic Robot will also be pouring. But, WAIT, there’s more: Over the two-day IPA Daze party, fest-goers will also have access to some of Washington’s best breweries, as guest IPAs will be made by: Elysian, Georgetown, Stoup, Aslan, Matchless, Holy Mountain, Wander, Hellbent, Silver City, Standard, Brew Hall, Skookum, Rooftop, 20 Corners, Two Beers Brewing, Black Raven, Chainline, and 7 Seas – truly a one-of-a-kind event. So where do the baby goats come in? Redhook wants to give guests a special treat, so Brewlab will have small petting zoo outside Brewlab from 2:00 to 5:00 p.m. on each day of the festival. And KEXP DJs will be on hand all weekend to keep the music fresh. An assortment of snacks and pizzas will also be available. With Earth Day just around the corner, Redhook will donate a portion of its proceeds from the two-day fest to their friends at the Surfrider Foundation, and you can join a beach cleanup with the organization on Friday, April 19 from 2-4 p.m., with an after party happy hour at Brewlab following the cleanup. More information about that effort can be found on their Facebook page.